The solar outdoor LED light & battery operated ice cube rocks by Pure Garden gives off a soft solar light while providing delightful accent lighting making it a wonderful addition to any yd. The solar light soaks up the sun's energy during the day & turns on at dusk. The soft white glow creates a romantic & lovely atmosphere. 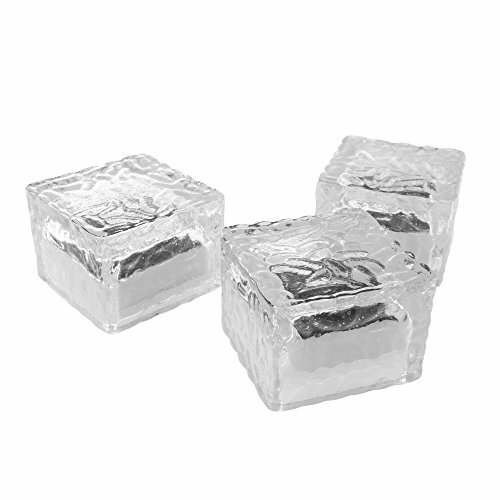 The simple & elegant designed ice cube rocks are made from durable glass & can be adored for years to come. Important: avoid buying counterfeit products & transacting with unauthorized sellers. Look for our logo on the packaging for every one of our products. Pure Garden is committed to providing the consumer with the absolute best price & value on our entire line of products, which we ensure by applying a rigorous quality control process. Bring life to your lawn - the Solar outdoor LED Ice cube rock light gives off a soft Solar light while providing accent lighting in your garden landscaping. Lights up all night - charges by daylight and comes with 1Pc rechargeable AAA Ni-Cd 600mAh Battery. Easy to install- designed for outdoor use in all climates. No wiring or external electricity required for use. satisfaction guaranteed - Pure Garden is committed to providing consumers with the absolute Best price and value on our entire line of products.